COLUMBUS, Ohio -- John Kasich sits, legs crossed and arms waving expressively, at the table where Abraham Lincoln sat with another Ohio governor and received a telegram informing him that certified election results made him president-elect of the United States. He is bantering with iconic architect Daniel Libeskind; the two unlikely friends have just unveiled Ohio's Holocaust and Liberators Memorial, a stirring, striking monument that rattles the conscience. He beams, not with pride, but with accomplishment - something most politicians never master. "As with all things in life, you get excited about something and there is always something that comes along and reduces it in some capacity or interferes with the day," he says. "Today was perfection." Earlier, he explained the significance of placing the graceful Holocaust and Liberators tribute outside Ohio's Statehouse, a limestone landmark completed in 1861: "Today is not about politics, today is about doing the right thing." "Kasich proposed and committed to the privately funded monument despite heavy political controversy," said Bernard Hirsch, a Korean War veteran sitting in the front row of the Ohio Theatre for the dedication ceremony. "Those bastards killed my grandmother," he said, referring to the Nazis, and "Kasich saw fit that she and all of the others are never forgotten." Kasich is nobody's guy; not tea party, establishment, conservative, moderate or any other brand placed on political figures; he is tough, prickly, skeptical, deeply spiritual, bull-headed, intuitive and, above all, a doer. He is Ohio's version of New Jersey's Chris Christie, without the star power or the bridge scandal. 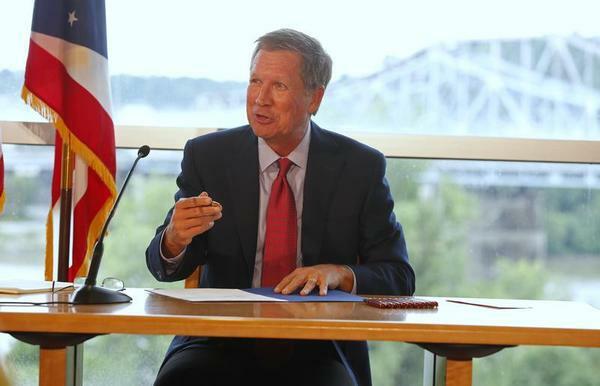 Up for re-election this year, Kasich is not on anyone's radar in terms of governors' races to watch; most political number-crunchers expect him to win in a state that Democrats desperately wish they could own in the lead-up to 2016's presidential election. Kasich is a unique politician, according to Neil Newhouse, a GOP pollster not affiliated with the Ohio Republican: "He's the real deal when it comes to being a compassionate conservative. He doesn't just talk about it - he does it. "He pushes that side of his agenda forward, unrelentingly, overcoming every obstacle. It's genuine, authentic - it's part of who he really is." That's why one Ohio Democrat privately conceded Kasich will be so difficult to challenge in November. "Plus, Ohio Democrats have never really recovered from the incompetence and tone-deafness of the Ted Strickland years," he said of the incumbent Dem that Kasich defeated in 2010. Kasich learned quickly not to be tone deaf when he lost Senate Bill 5, a collective-bargaining overhaul, in a statewide referendum; he bottomed out in state polls but his unpopularity didn't stop him from plowing forward on policy. A vocal opponent of ObamaCare, Kasich nonetheless expanded Medicaid rolls over the opposition of his GOP-controlled legislature. Under the state budget bill he signed this month, low-income Ohioans will receive larger personal tax exemptions, something typically reserved for the wealthy. He also gave an extra, temporary tax cut to business, put in reserve $300 million for unexpected Medicaid expenses, and added money for mental health and addiction-treatment programs. Born in a working-class Pittsburgh suburb, Kasich left for Ohio after college; he served in Congress, representing Ohio's 12th District from 1983 to 2001. His gubernatorial opponent, Cuyahoga County Chief Executive Ed FitzGerald, has struggled to capitalize on Kasich's faults, to raise money, to gather support from state Democrats or the business community (although he did get Bill Clinton to host a fundraiser for his campaign). Kasich has led FitzGerald in every recent poll; the RealClearPolitics aggregate polling shows him with a comfortable 9-point lead. Kasich's wife, Karen, sitting in an adjoining room at his office, walks in to tell her husband that she and their twin daughters are heading home. He immediately relaxes, smiles, and they hug; and as she walks out the door, he beams again - this time with pride. In an era of deep polarization and critical distrust of all things Washington, Kasich is not perfect; he is not all things to all people. But he is an example of a competent manager hell-bent on reform, on being a doer, and that is something both sides desperately want all across the country.